The Red Buttes Wilderness' namesake peaks. The namesake peaks of the Red Buttes Wilderness rise like reddish-orange pyramids above the forest, but because they’re so well-hidden in the mountains, few people ever see them. That was a big reason myself and the Outdoors Gal decided to explore this remote region on a sunny day in June. The namesake peaks of the Red Buttes Wilderness might be the most antisocial mountains in Southern Oregon and Northern California. Despite a brilliant reddish-orange color that makes them among the most distinct landmarks in the Siskiyou Range, the Red Buttes do such an effective job of hiding from the populace they’ve largely escaped local consciousness. The Outdoors Gal and I decided to try to change that on a Saturday in June, during a trip into the realm of peaks that rise above the wilderness like pyramids from a forgotten civilization. The Red Buttes Wilderness was designated by the U.S. Congress in 1984 and includes 19,940 acres across Oregon and California. There are multiple access points, most of which originate on roads beginning in the Applegate Valley (to the east) and the Illinois Valley (west). The roads and trails have a well-deserved reputation for being rough and sometimes overgrown which, combined with the lack of visitors, probably contributes to the suspicion that Bigfoot calls these mountains home. I’ve explored most of the Red Buttes during the past few years, and sadly I have never seen evidence of good-ol’ sasquatch. What I have seen are alpine lakes encircled by sweet-smelling azaleas, bright orange valleys and a combination of easy and difficult trails that could (and should) be explored by more people. But for a real sense of the Red Buttes — to understand what makes this wilderness special — I decided it was important to venture into heart of its namesake peaks. And so we drove out past Applegate Reservoir on a sunny day, crossed into California and began climbing up Forest Service Road 1055 toward Cook and Green Pass. This particular road is a nice illustration of why the Red Buttes are rarely visited. There were rattle-inducing divots on a steep and winding road probably not suitable for low-clearance passenger cars. We reached Cook and Green Pass after a 1 hour, 45 minute drive from Grants Pass, and set off along a stretch of the Pacific Crest Trail — the famous route which runs 2,663 miles from Mexico to Canada — and happens to border the Red Buttes. 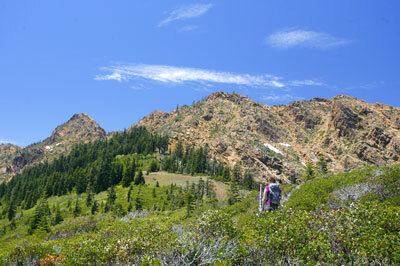 Although this section of the Red Buttes remains remote, the area is far from pristine. Old mining roads slice in every direction (although not across the wilderness boundary), and a very rough road actually parallels the trail for part of its journey. The road is almost never used, however, in part because it misses the best views on the trail. The first mile brought us up a steep forested ridge. The snowy outline of Mount Shasta greeted us after one mile and, just around a bend in the trail, came the first view of the Red Buttes. Whoever named the wilderness was either color blind or believed that “Red Buttes” sounded superior to “Orange Buttes.” In any case, the peaks are a sight to behold. They're a dark, rich orange streaked with white marble veins that preside over an open ridgetop with views deep into California. The cool part about the trail is that it doesn't just provide views of the buttes in the distance, but brings you almost face-to-face with them. At the 2.5-mile mark, the trail comes to their craggy base, below which is Echo Lake, wrapped tightly in the valley below. The trail crosses the road at the 3.1-mile mark and the landscape begins to feel more like a wilderness. There's a wildflower valley directly below the official 6,739-foot Red Butte peak, and after four miles the trail hits Lilly Pad Lake, which is scenic, but not a place you'd want to swim. The Outdoors Gal and I decided to continue hiking to Kangaroo Spring, a bright orange cathedral of rock at the 4.8-mile mark where we enjoyed lunch and, oddly enough, discovered a few small sea shells. Strange as this may seem, the sea shells actually provide a hint to the Red Buttes' geologic origins. The buttes are composed of peridotite rock that originally formed in the ocean a few million years ago. The Siskiyou Mountains were created when the North American Plate ripped westward, pushing seafloor to the surface and creating bizarre and beautiful peaks such as the Red Buttes in the process. (For a much more thorough explanation, consult your local geologist). After lunch, we hiked back to our car in what seemed as though it took only a few minutes. The trip was just less than 10 miles, but because the scenery is nonstop and the trail's gradient friendly, it never felt difficult. The namesake peaks of the Red Buttes Wilderness might be the most antisocial mountains in Southern Oregon and Northern California. But those willing to drive gritty mountain roads are rewarded with a near-perfect day hike through reddish-orange pyramids few people will ever see.